Add 2 Puzzle Books to Cart, Get $1 Off each! The pens didn't write so I tried to change to refill the whole pen feel apart couldn't get back together, so I opened another pen to see how it was put together now I have 2 pens I can't use. They didn't write and it would cost more to send them back than what they originally cost. Not worth the money- all three of the pens were dry as well as the refills HUGE disappointment. I have been looking for a pen like this. Did'nt know they still made these! I do a lot of crossword puzzles. But I will say the ink does not last very long. Because I would imagine the ink will be easier to see than pencil, and it is erasable. Like to do crossword puzzles. friend requested when I asked her what she would like for a present. I like to do my puzzles in pen, but I'm not perfect. I do a lot of crossword puzzles and pencil doesn't show up very well in most books. Pens seem to solve that problem. I like crossword puzzles and prefer erasable pens in case I make an error. This set of 3 pens w/ refills and replaceable erasers at such a great price was hard to pass up. I do a lot of puzzles so thought they would be handy. 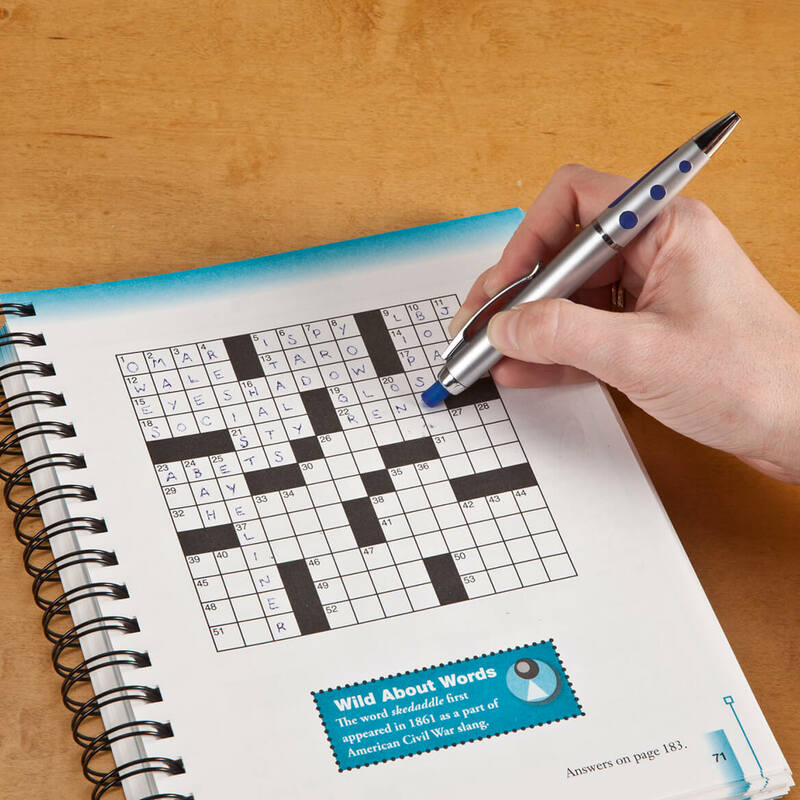 My husband does a lot of crossword puzzles and when he uses regular pen he makes a mess. 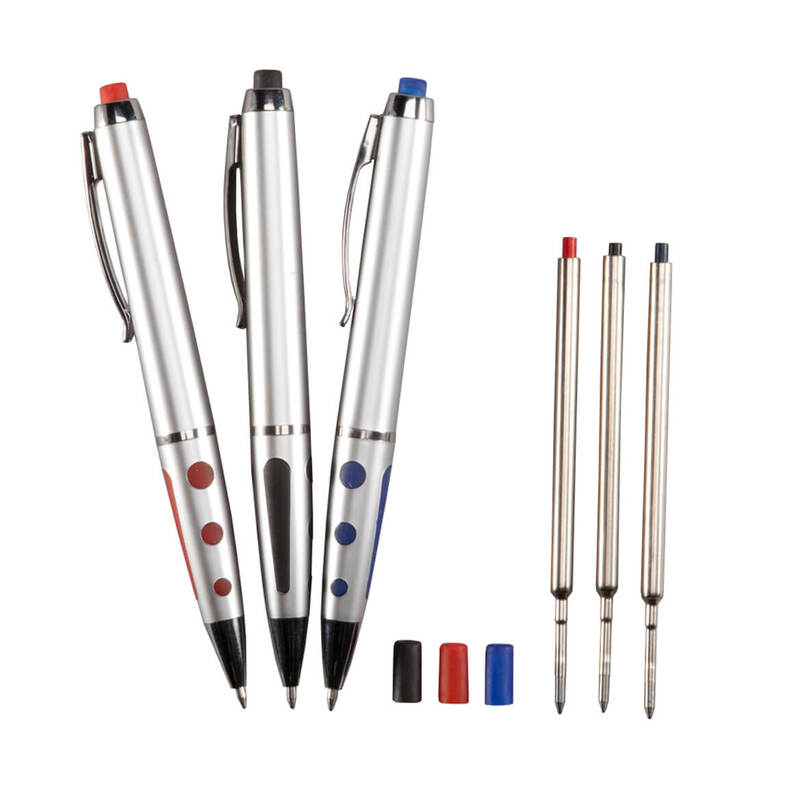 I purchased these pens because I liked to use them for my daily calendar and I do a lot of crossword puzzles. I like those kinds of pens. I need them to do crossword puzzles. I have several brain enhancement puzzle books.I can use these prns to erase the answers and work them again. I’m always needing to erase on puzzles. I work crossword puzzles all the time..
need to do my puzzle books when I make an error. 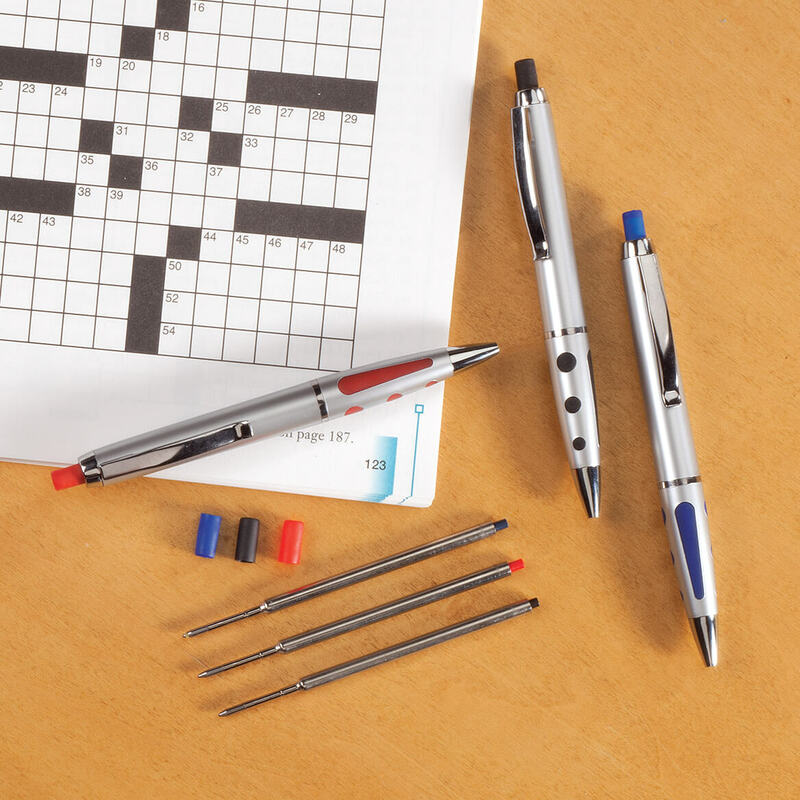 I do crossword puzzles and I think these pens are perfect!! This is a Christmas present for my husband. I have one of these pens and I am delighted with it. It has blue ink which is almost dry. I can't wait for the three pens with different ink colors. i have used them before & i like them! I love adult dot-to-dot, but would rather use pens. Does the ink become permanent? BEST ANSWER: No, it's erasable. Eraser is on the pen, the part you click. The red one is not very bright. Can you use it in bibles? BEST ANSWER: Thank you for your question. Yes this item can be used in bibles. We hope this information will be of help to you.